You’ve invested in your home by adding beautiful hardwood floors. Now you have to determine: how will you keep your floors looking beautiful? What is the best way to clean hardwood floors? We know that oil soap bottle says it’s perfect for wood, but oils and waxes will leave a residue on your floor that will build up over time. Furniture spray will give your floor a nice shine, but it will also make your floor incredibly slippery. Save your ankles and skip this method. A solution of vinegar and water is great for cleaning lots of things, but not for your hardwood floors. The acidic nature of vinegar can dull your floor’s surface. Water may seem pretty inoffensive, but too much water can be a bad thing. . If you use a soaking wet mop, water can cause problems with your floors. 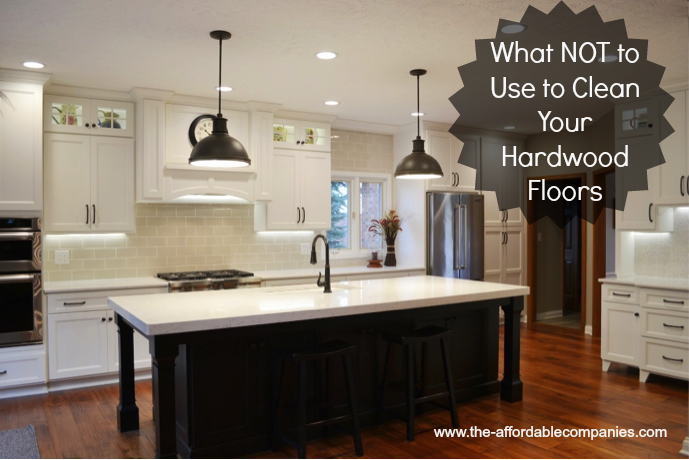 So, what can you use to clean your hardwood floors? Use a soft cloth to clean up spills as soon as they happen. Try to always avoid having liquids sit on your hardwood floors for any period of time. Sweep or vacuum regularly to collect dirt and dust. Use specialized, manufacturer recommended floor cleaners that are designed to keep your floors looking great. Maintain a normal relative humidity in the home (between 35% and 55%) to minimize expansion and contraction of the wood. Use entry mats, which will help collect dirt, grime, dust, and sand and keep those elements off your hardwood floors. Our experienced team can not only help you find the right hardwood for your home, they can also help you find the best strategies for keeping it beautiful for years to come. If you have questions about choosing, installing, or maintaining hardwood floors, we’d love to help. Contact us with your questions, or stop by our showroom to learn more.